FILE - A Somali soldier patrols a street following a suicide car bomb and gun attack in Afgoye, Somalia, Oct. 19, 2016. Security officials in the Somali town of Afgoye say they are not aware of the presence of pro-Islamic State militants in the town, despite a series of social media posts by the group claiming responsibility for attacks in the area. Afgoye police commander Captain Abdulkadir Osman Mursal says attacks against civilians in Afgoye are carried out by the al-Shabab militant group and not "Daesh," but says police are "on alert and investigating the claims." "Daesh and al-Shabab are the same to us, they both kill civilians," he said. Pro-Islamic State militants have been claiming responsibility for series of attacks in Afgoye since the second half of last year. One of the attacks in January took place last week with pro-IS militants claiming they killed a finance officer. In another incident in January, the group said it killed a man who worked for the national intelligence agency of Somalia. IS even published a purported video showing assassins carrying pistols who approached the target from a behind. The young man who is already lying on the ground is shot and killed. Even more confusing, al-Shabab claimed killing an intelligence agent in Afgoye on the same night, but did not provide any video or pictures. It is unclear if the two militant groups are claiming responsibility for the same incident. Mursal says he went to the scene on January 13, and the person assassinated was not an intelligence officer. "I went to the scene where he was killed, they arrived on a motorbike, they killed and they escaped to the villages near Afgoye," he said. "The man they killed was a student at a university in Mogadishu; he also worked as a teacher in Afgoye. He was not a soldier, he did not work for the government as his relatives told us, he was a civilian." Mursal says residents told police that assailants who carried out the killing may have escaped the town. He says he is certain about the people targeted regardless of the claims. "They target a civilian person who is vulnerable, and then when they escape they claim that he was with government security agencies," he said. Mursal believes al-Shabab is responsible for killings in the town. "As far as we know, the group who are denying people to live and to have peace, who kill them and then brag about killing innocent civilians, are al-Shabab," he said. There have been at least seven killings reported in Afgoye in January. Apart from the student, they include soldiers, tax collectors, a religious man, and a social media enthusiast who posts messages condemning the killings on his accounts. 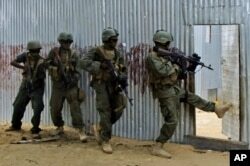 FILE - Somali soldiers search through homes for al-Shabab fighters, June, 2, 2012. Mursal admits that no one has been arrested for the January killings, but says police are on the "heels" of the attackers. Residents in Afgoye say they are concerned about the reports. One resident who did not want to be named for safety reasons said the presence of pro-IS militants could worsen the security of the town, which is already under constant attack from al-Shabab. "If they compete for killings in our town, that is a big problem for the people," he said. Observers also believe the danger could be real and urged the government not to take the reports lightly. The only other place where pro-Islamic State militants claimed responsibility for attacks last year has been Bosaso in the far northeast of Puntland. Despite the insistence that it's only al-Shabab that is killing people in Afgoye, Mursal says they are exercising caution. "We are on alert, we are cautious, we are conducting operations during nighttime and daytime," he said. "We are investigating, and we will follow up the claims but we are not aware of their presence." One possibility, Mursal says, is that attackers are coming from the outskirts of Afgoye where foreign militants hide. Afgoye is surrounded by farmlands and forests where militants plan and launch hit-and-run attacks against government troops and the AMISOM forces of the African Union. Afgoye, a populous, agricultural town just 30 km southwest of Mogadishu, is crucial for the security of Mogadishu, as it links the capital to the southern and southwestern regions of Somalia. It's also the gateway to at least six regions to Mogadishu.